I bought this DVD a while ago from M. Britton's website (same price!) and all I can say as a beginner is that it is worth every penny. I learned a lot from handling drawing tools, to drawing techniques and anatomy. As a European (educated in Italy) I found Mr Britton extremely professional and detailed when instructing, in other words, even though he makes the subject easy for you to follow, he doesn't talk down to you by dumming it down. While you realize how much work is ahead of you to get to that kind of level, the process and the result of the portrait executed by his skilled and talented hands are absolutely inspiring, and doesn't allow you to quit or be discouraged. From my point of view this DVD belongs to libraries! The quality of the DVD is very good! I recently purchased Mastering Portrait Drawing and am absolutely, completely blown away by it! I attended art classes in the seventies and have ever since been searching for more direct and intensive art instruction. I am basically a landscape painter,however, I have recently been getting many requests for portraiture, especially children. While this DVD is for portraiture, I see an immediate improvement in my initial landscape layouts. I am leaving next week to go to Jackson Hole and spend 10 days in Grand Teton and Yellowstone parks to do alot of plein air painting and am eager to see if there is an immediate difference in my painting approach. Thank you so much for your dedication and superb instructional abilities! First I wanted to let you know how much I have enjoyed your DVD's I recently purchased both the Portrait Drawing DVD and the Symphonic Composition. Both of these sets are absolutely the best instructional sets I own. Your instruction is understandable and comprehensive. Thank you for making these available for those of us unable to take your workshop. I look forward to many hours of "instant replay" until I can extract all of the valuable nuggets you have provided. Additionally, the information on the Golden Section is so very well presented. I never completely understood this until watching your DVDs. Again, thank you. I just wanted to thank you for your wonderful portrait dvd, I spend a lot of time with you and Sonja. The amazing thing is how much it has helped. In the first week my portrait skills have increased a hundred fold. Yes, I said "a hundred fold", all those dumb little mistakes were really costing me. are very lucky to have him as a resource. 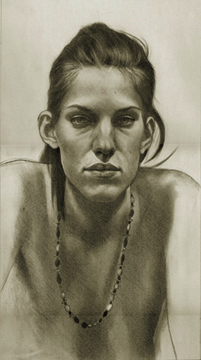 Drawing portraits is generally something that most people assume one must be born with a talent for. Sure there are those for whom portait drawing is a God-given talent, but everyone no matter what their 'talent' level must study and acquire the skills and knowledge necessary to grow and develop as an artist. Being able to consistently get a remarkable likeness in your face and portrait drawing can be learned. But there is a skill-set that must be acquired. The first is the ability to strike the arabesque, that is the entire outside shape of the head. The arabesque encompasses the overall shape and proportion. 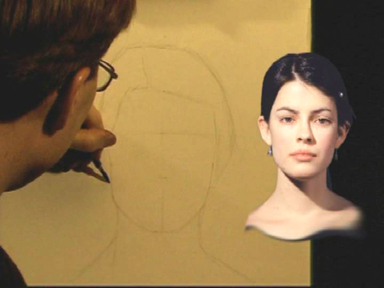 From there, one constructs the portrait by fixing the facial proportions and then blocking in the initial tone. Even at this very early stage the likeness of the sitter will begin to emerge in the portrait drawing. The next requirement is knowledge-based: to make sense of and convincingly render the features and supporting cast of cheeks, chin, forehead, etc. you must know the underlying anatomy of bone and muscle. Anatomy plays a crucial role in conveying emotions. There are different muscles actions for joy and for melancholy. It is more than just a smile on the lips. Once you attain the skill-set of portrait drawing you will find it to be immensely satisfying and your growth as an artist will accelerate. Seeing the likeness of your loved one or client or model emerging from the paper under your hand is a real accomplishment. Much better than to forever be struggling with the basics of portrait drawing with little or no progress. You will find all of the tools you need to develop your portrait drawing to a high-level in my Mastering Portrait Drawing Workshop: The Frontal Pose. All the Tools and Materials used to create realistic, professional-looking graphite drawings; and best of all they’re simple, easy to find and cheap! Establishing Proportions and placing the Features correctly from the start - If you don’t want the nose to end up on the forehead you better know this! Background and Finishing considerations for professional looking works of art. my Fundamentals in Portrait Drawing, Volumes 1, 2,3 & 4. These E-books (each averaging 75 pages) get you STARTED NOW! 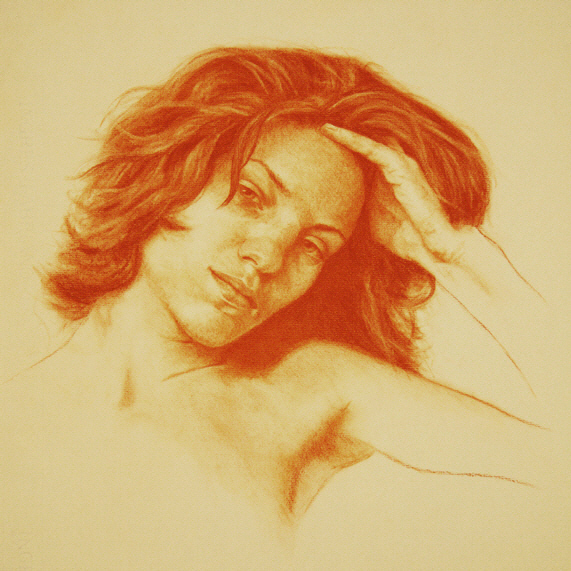 Mastering Portrait Drawing 1: the frontal pose workshop is four hours of solid training! 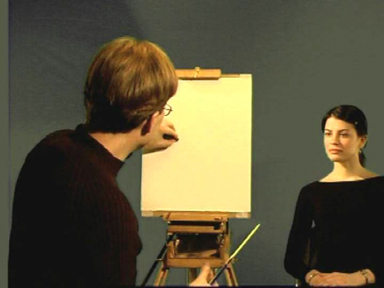 Originally published as a 2-DVD set for $157 Mastering Portrait Drawing 1 is now available as in instant video download for only $57. Consider that many portrait drawing DVD's that sell for $30-$35 are only 60 minutes in length, and in that short time frame many important aspects of portrait drawing can only be touched upon at best, and the value of this intensive workshop is immediately apparent. Working from my model, Sonya, each step of the entire portrait drawing process is thoroughly discussed and demonstrated. Unlike most demonstrations the camera is positioned so that you see the drawing straight-on from the artists' viewpoint alongside the reference photo. 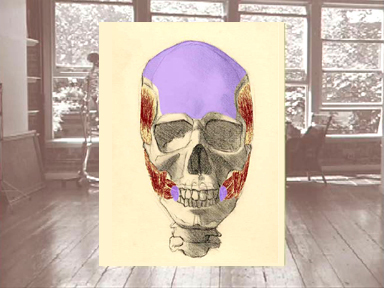 Also included in Mastering Portrait Drawing: the frontal pose is the comprehensive anatomy of the head which builds up the skull and musculature step-by-step. As with understanding planes, anatomy is vitally important to successful portrait drawing. Unlike streaming videos which can only be watched once or a few times (depending on the purchase agreement) instant download workshops are your's to keep and study as many times as you like. Get Mastering Portrait Drawing: the frontal pose instant video download workshop (that's 4 hours) for ONLY $57! AND get over $60 worth of five BONUS E-books!! 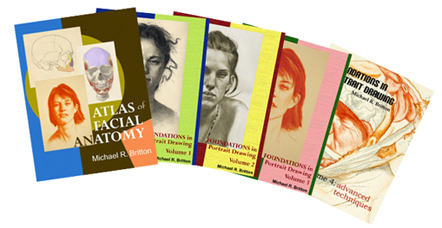 That's the Atlas of Facial Anatomy and Fundamentals of Portrait Drawing Volumes 1, 2, 3 & 4 FOR FREE!!! Get Mastering Portrait Drawing 1: the frontal pose Instant Video Download for ONLY $57! 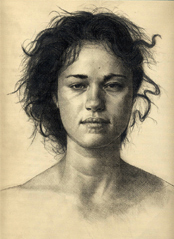 PLUS get the four Fundamentals of Portrait Drawing E-book and my Atlas of Facial Anatomy!